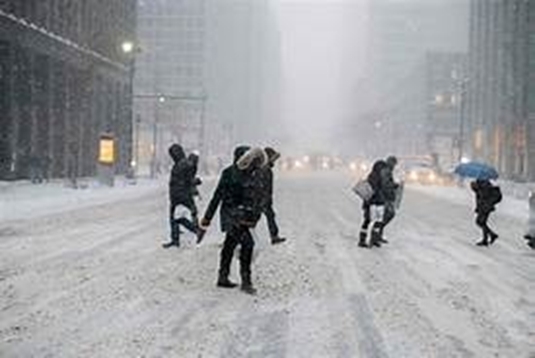 This past Thursday, 15 November 2018, New York City had its first snowstorm of the season. The question is in what season are we? It seems as if autumn just started and, yet, it is winter cold. Right now, it is 41-degrees Fahrenheit, in NYC, but it feels colder with a mild wind. After the snow, it rained. It rained later on Thursday night. The snow was gone in the morning. As it was also warmer, in the morning, there was hardly any slush or ice on the ground, either. NYC was lucky this time. Still, it took me over an hour to get home from work that night. Normally, it takes me fifteen minutes. One of my co-workers lives in Suffolk County and it took her over four hours for a forty-five minute ride. On 22 November 1989, a huge snowstorm hit Long Island and New York City. At that time, I was young, single and childless. My sister, Elyse, was living in Chicago and her in-laws invited me to Thanksgiving Dinner at their house in Greenlawn, New York. I was worried, with such a big storm they would cancel Thanksgiving Day dinner. The storm stopped just short of Thursday, giving the towns and counties a chance to plow all the roads. Over five inches fell on Long Island, with the largest accumulations in the towns of Northport and Centerport, which are on Long Island Sound. Over seven inches of snow accumulated in those communities. Because I couldn't remember the date, I called my sister and her memory was as fuzzy as is mine. As I was talking to my nephew, my sister searched and found the date quicker than I did. What are siblings for if you can't call them out of the blue asking about something that happened twenty-nine years ago? What I remember most of day was her father-in-law, Andrew, sleeping in the den, with his arm over his head, to block out the world, and seeing all that snow outside. Somewhere I have a picture of that. I spoke to my father, tonight. He lives in Syracuse, NY, the snow capital of the east coast. They get more snow in the winter than any other location, although Watertown, NY, a hour north west of Syracuse gets a great deal of snow, too. This week Syracuse already had fifteen inches on the ground. Between the rain and plows its snowfall is mostly gone by now. People in Syracuse are so used to heavy snowfalls that nothing stops until they get at least two feet of snow. My father lives is on a main road, which is rather steep. It runs from one end of Syracuse to the other. Since he doesn't have a death wish, he doesn't venture out in horrible weather, especially at night. I wonder, do we really have an autumn or fall season anymore? It seems that summer is getting longer, fall is getting shorter, winter is becoming longer and spring seems shorter, too. We can blame this all on climate change, holes in the ozone layer, global warming and the naysayers in the Republican Party that bury their collective heads in the ground and ignore everything wrong with the environment. I cannot understand how our idiot president is repealing environmental protection laws and letting big industry pollute our air and water, again. It took decades for them to get the air and water clean. Now, big industry will revert to their polluting ways. While I’m at it, why do we still switch between Standard and Daylight Savings Time, ST and DST, respectively? Wouldn't it make sense to stick with one or the other year round? The Canadian province of Saskatchewan does. Personally, I prefer DST. I'd rather wake up in the dark and drive home in the light. This whole "spring forward and fall back" mentality is for the birds. Enjoy this short fall for now, because it feels like it is actually over. I wish everybody a happy thanksgiving 2018.